The defense chiefs of South Korea and the United States on Wednesday signed a strategic guideline on how their combined defense mechanism will operate. The guideline, called “Alliance Guiding Principles,” contains a set of commitments to continue to station US troops in Korea, retain the allies’ Combined Forces Command and the UN Command, and have a South Korean four-star general lead the CFC. Defense Minister Jeong Kyeong-doo and his US counterpart James Mattis inked the document after they held their 50th Security Consultative Meeting in Washington, the allies’ annual top defense dialogue. The guideline sought to dispel worries among conservatives that the OPCON transfer may eventually lead to the pullout — or drawdown — of American forces in Korea, the dissolution of the CFC and a weakening of the allies’ combined defense posture. “The Alliance Guiding Principles are a document that we drew up while thinking of the future of the alliance more than 50 years ahead,” Seoul’s defense ministry said in a press release. “The principles are expected to address citizens’ security concerns by presenting a direction for the South Korea-US combined defense system after the OPCON transfer and proclaiming the firmness of the South Korea-US alliance,” it added. Among those concerns was the possibility that the US, with the world’s largest military, may not be willing to undertake a deputy commander role in a combined unit with its ally. But Seoul officials said that concern has also been settled through the guideline. “The national authorities of the US are to appoint a general or an admiral to serve as the deputy commander of the post-OPCON transition CFC,” the strategic document reads. The guideline also includes the US’ continued provision of extended deterrence to South Korea and of “bridging and enduring” capabilities for the defense of its Asian ally. The extended deterrence refers to the US commitment to use a full range of military capabilities, including nuclear, conventional and missile defense assets. In the cases of major changes in the allies’ combined defense system, such as the transfer of peacetime OPCON in 1994, Seoul and Washington issued a “strategic directive” to the CFC for implementation. But the issuance of such a strategic guideline is rare, Seoul officials said. The guideline is among a series of other strategic documents that Jeong and Mattis approved on Wednesday. One of them is the memorandum for the record of the allies’ future command structure. It entails the agreement that a South Korean four-star general will lead the CFC with a US four-star general being its deputy after the OPCON transition. The defense chiefs also agreed to carry out their verification next year of South Korea’s initial operational capability to lead combined forces. After the IOC verification, the two sides will verify Seoul’s full operational and full mission capabilities. South Korea handed over the operational control over its troops to the commander of the US-led UN Command during the 1950-53 Korean War. It was then transferred to the chief of the CFC when the command was launched in 1978. South Korea retook peacetime OPCON in 1994, but the US still possesses OPCON in the event of war. The transfer of wartime OPCON was supposed to occur in 2015 but was postponed, as the allies agreed in 2014 to a conditions-based handover due to Pyongyang’s nuclear and missile tests. During the SCM, the two sides finalized their decision to suspend their annual massive Vigilant Ace air exercise, originally slated for December, to back up ongoing diplomacy to build trust with North Korea and encourage its nuclear disarmament. The decision was made based on the judgment that the allies can harness high-tech weapons systems and online communication tools to conduct exercises without joining together. The US Department of Defense previously said that the allies agreed to suspend the exercise. But Seoul’s defense ministry said the allies just weighed “various ideas, including suspension” in an apparent indication of differences over the fate of this year’s exercise. At the SCM, Seoul and Washington also agreed to conduct joint research on the defense vision of their future alliance. “The research will draw up a joint vision aimed at developing the alliance’s cooperation in the defense sector into a more complementary and future-oriented way,” the ministry said. 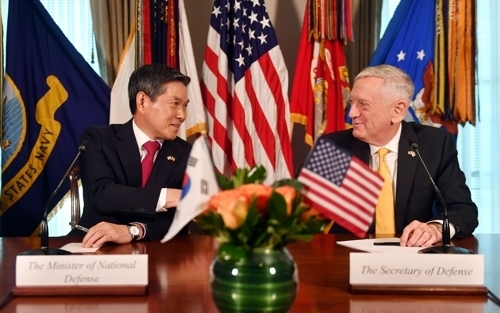 After the SCM, Jeong and Mattis issued a joint communique. The statement, moreover, said that Jeong and Mattis also committed to continue to maintain close cooperation between the allies’ military authorities during the process of implementing the recent inter-Korean military agreement aimed at reducing tensions and preventing accidental clashes. Mattis reiterated the US commitment to maintain the current force level of US Forces Korea and reaffirmed that Washington will provide extended deterrence to South Korea. Unlike past SCM statements, this year’s communique did not include any strong warning against North Korean provocations.